Penguin presents the audiobook edition of Stick with It by Sean Young, read by Roger Wayne. We all have bad habits - whether it's a weakness for junk food, a smartphone addiction or a lack of exercise. But change is hard. Forty percent of dieters quit within a week. Eighty percent of New Year's resolutions don't last beyond January. How can we kick bad habits - and stick with it? According to psychologist and behaviour researcher Dr Sean Young, the answer is to stop trying to change the person, and instead change the process. 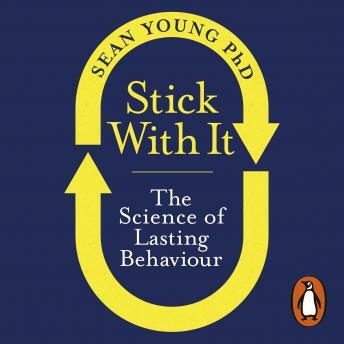 In Stick With It, Dr Young draws on his own research and that of other leading experts to explain how the mind often interferes with breaking bad habits, and how we can outsmart it, increasing the likelihood of lasting change by 300%. Packed with practical exercises and real-life case studies, Stick With It shows that it is possible to control spending, stick to a diet, exercise regularly and overcome problem behaviours - forever.